The unsprung levers are fixed to the back plates and by design are handed. Fixing lugs are supplied on both backplates (2 on each) for a more secure fix. Easily reversible. 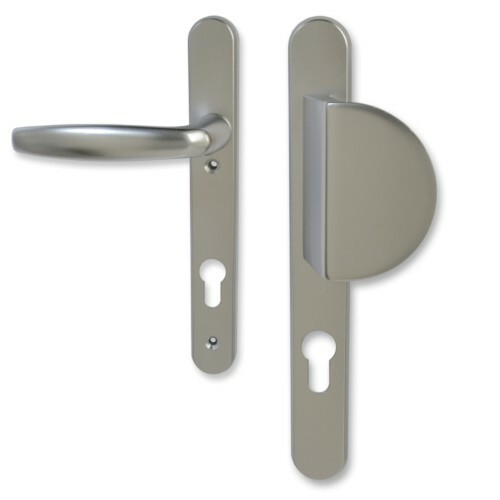 RH illustrated handles to suit FUHR, AGB, ASGARD, KFV, MACO, WINKHAUS, GU, LOCKMASTER (SPRUNG) MILA. Hi guys. My name is Darrel and I'm head of the tech team here at LocksOnline.co.uk and thanks for tuning in and having a look at one of my product review videos. 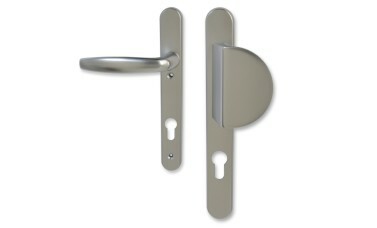 The product that we have here with us today is the Hoppe fixed pad lever set, or fixed pad lever handles for UPVC doors. This is the actual outside part of the handle set, and of course this is the inside here. But let's concentrate on the outside first, to give you some sort of a unique idea as to why that you'd want a fixed pad. Now, some UVPC doors are what we call in the industry wind-up locks. In other words, you can actually close the door behind you and you insert the key into the door. You don't lift the handle. You would wind the key around, and by winding the key around it would throw all the bolts or all the multipoint solution. 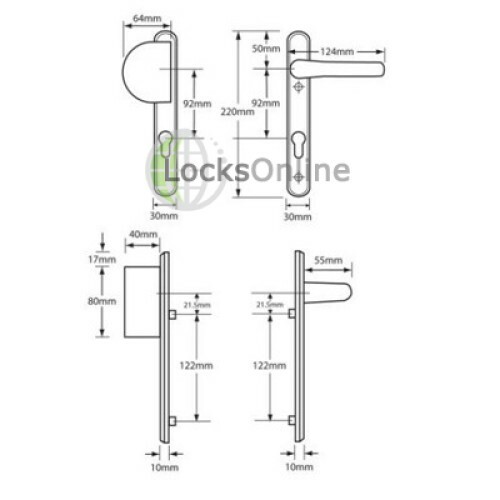 Now the benefit of this particular type of multipoint lock is that normally if you put the key in and you unwind the door, when you get to the final turn it actually withdraws the latch and allows you to open the door. So the actual lock then becomes like a Yale sort of lock. When you close the door from the outside, it's locked on the latch. And then when you want to deadlock it, you put the key in like an ordinary pretty standard lock and you would then wind the lock and it would throw all the bolts. So therefore, there is no need to have a handle on the outside of the door. And that's the reason why you would therefore have this, what we call in the trade a fixed pad. The whole idea, the whole purpose of this pad is you would just pull the door behind you and you can then ensure that it's on the latch. And then if you want to deadlock, you put the key in and then you deadlock a little bit further. Now, this handle here can be turned around. If you notice here, you've got some screw fixings here. What you would do is you'd undo those three there, and therefore then you can turn the handle around should the actual handle on your door work in the opposite hand. So this can be moved to the opposite side if you need to do so. Now, these are designed to work with what we call in the industry 92mm centres, or PZ of 92. And that measurement is the measurement between the centre of the handle there, to the centre of where the keyhole for the cylinder is, guys. All right? It's not the centre of the cylinder, it's the centre of the keyhole. So from there to the centre of the handle, on this measurement on this particular range is 92mm. Now, if you're saying to yourself "Oh, this looks like the handles that I've got and I'm looking on wanting to replace them" there are some little ident markers actually inside. And I don't know if you can actually zoom in there Lee, if I hold that as tight as I can? Right in there is a row of numbers. I think it's got some threes and so forth in... I don't know if you can get that a little bit better there? Yeah, it's a little bit out... but let me read that out to you. It's quite difficult to read actually. It's 3360N. And underneath it is the number 12. And on this particular handle then, we've got 3370N. And underneath that we've got the number eight. All right? So just to let you be aware, I don't know if you can zoom in and see on that one, a little bit more detail on that particular handle? Maybe not. Anyway, that's the sort of markers. They are reference markers that are used by the manufacturer Hoppe to give themselves some sort of ident system of what they are. And that might help you then ident whether or not this is the handle that you need to replace. Now the follower, in other words the size of the spindle is 8mm as standard, okay? And it comes with two fixing screws as well. It's available in the chromed finish, which is what you see here. 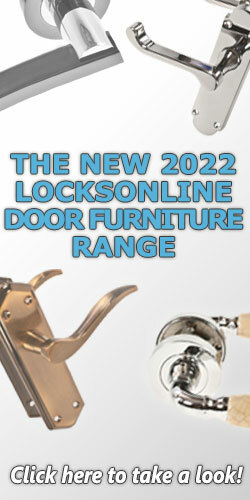 A satin chrome sort of finish with a bit of ergonomics there with regards to handle. 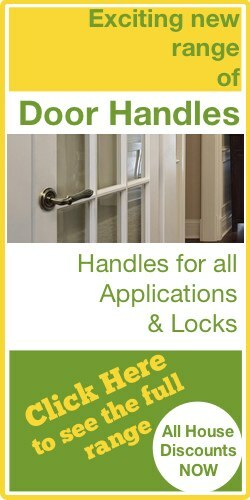 Of course, then this handle can be handed whichever way your door opens. So that's fine. It also comes in a white finish and also a gold finish. Also, there's a little crest that sits on the top of the handle there, which is the Hoppe crest. And again, that's another marker to help you identify whether or not this is the set of handles for you. So, I think I've covered all the bases there. What I'll do, is I'll get you some measurements just to make sure. The overall size of this particular handle from the top to the bottom there is just a smidgen off 220. And those fixing centres, if you notice there, there's no fixing above the handle. It's below the handle and below the cylinder there. And those fixing centres there guys... let me get a quick measurement on that. I would say that's 122mm, okay? Give or take a mil. So there you go. It's the fixed pad set. A lot of manufacturers of door locks etcetera use this particular type of handle and it will work with a myriad of them. 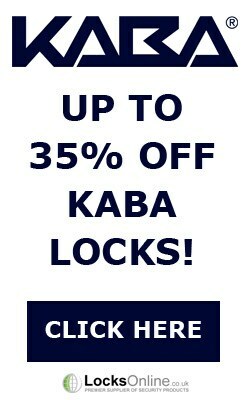 And I think we've got those listed on our site, so you can check off the make of your lock to make sure that these handles will work for you. Now if there is something that I haven't mentioned that you think "Oh I need to now that" or "I'd be interested in getting to know what that is" pop us over an e-mail. Use the phone in the daytime, or free it's the live chat. You can either just speak to me or any of the guys in the sales team. 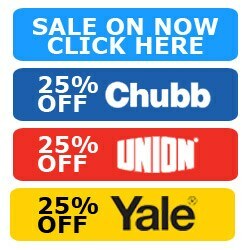 We're all knowledgeable on these particular ranges of product. Either way, what we really do is, we'd love to see you as a customer. That would be a really plus for us. So from me, Darrel, and all of us here at the LocksOnline team, thanks for taking the time to look at this short little video and catch you again with us soon. Take care now, guys. Bye-bye now.